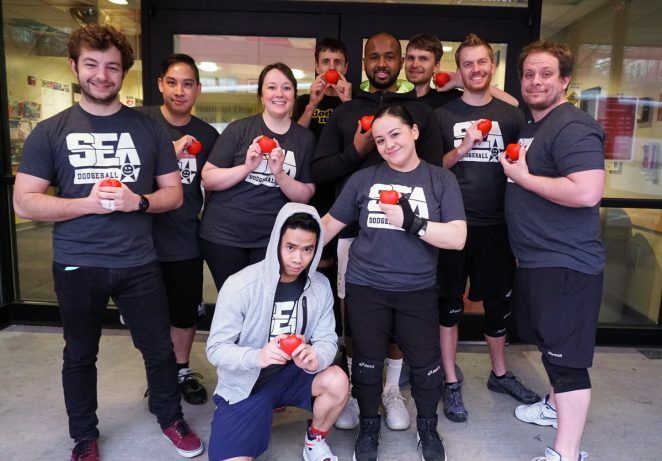 As Dodgeball Seattle has created a home for many people in the dodgeball family; we’ve decided it’s time to make space for our LGBTQIA+ community members to enjoy all that this community has to offer. The Rainbow league aims to provide a safe space for the LGBTQIA+ Community to learn and have fun playing dodgeball, to grow without judgement, and to gain self confidence through the sport. For example, we want to make this a welcoming space for those who were hesitant to play sports in their youth and might be interested in trying for the first time. The Rainbow League allows the LGBTQIA+ Community to build strength, relationships, and confidence together. Whether throwing a ball for the first time or playing sports your entire life, all experiences and skill levels are welcome to join the fun. This is our first Rainbow league, but here’s what the DBSEA community is all about. Wednesday nights from 7:30-9:30pm at the Yesler Community Center [map]. The league is seven weeks begins May 1st, 2019 and ends June 12th, 2019. The first six weeks are league matches and the last week is the PLAYOFFS. The last day will be followed with the AWARDS PARTY!!! Having fun is our priority. We really love dodgeball and we love each other. We laugh, we dodge, we wear costumes, and we like to go out together for food and drink afterwards.